PREVAILED STUDIOS IS A MULTI-MEDIA COMPANY THAT PRODUCES HIGH-QUALITY PHOTOGRAPHY, VIDEOGRAPHY, GRAPHIC/WEB DESIGN, AND AUDIO ENGINEERING. Kristen is the visual junkie. 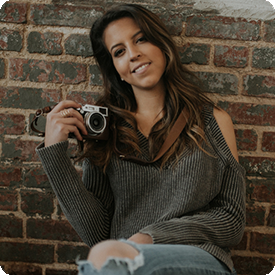 Her first love is graphic design, but photography is one of the best ways she expresses her creativity and love for others. She also loves Indian and Italian food and cuddling with her dog, Kellie. At Prevailed Studios we pride ourselves on our unique approach to projects. We value teamwork and recognize the importance of client relationships. Our innovative ideas work in harmony with our diverse skillset to produce content that far exceeds client expectations. Christian has a desire to capture moments on video, but the best projects allow him to merge the audio and visual world together. When he's not working on a creative project, he's playing in his band Acoustic Pursuit.